after many try-and-error runs I was able to adapt my "outdoor" theme and create the new "outdoorV4" theme, which can be used with the new multi-language mapsforge V4 OpenAndroMaps. It is compatible only with these new maps! In general, I have tried to make the theme identical to the existing "outdoor" theme. Due to problems with many tags used for the configuration of font sizes and priorities, many small changes had to be made. You will find more details (i. e. which tags had to be ommitted) an my website www.maiwolf.de/locus/ [in German]. Please take the theme as a draft. I am happy for any comments, suggestions and there will be constant improvements. Maybe, I will adapt in the future also my existing "desert" theme. 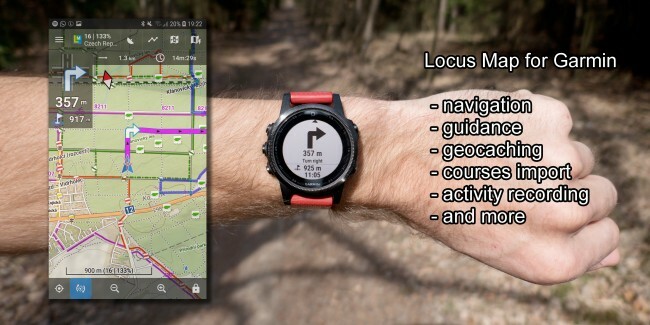 on behalf of WearSoft and with cooperation with Locus Map team, I want to introduce you new application which enables you to benefit from advanced features of Locus Map while using your Garmin device. We just released fist public beta to limited number of devices and waiting to receive feedback from you before we add also lots of other Garmin models to compatibility list in next days. For version 0.8.0 we added support for Fenix 5 and Fenix5S watches. You can use app just for easy track import from Locus Map or use it as main application during your activities and be navigated or guided by Locus Map in you phone while recording activity for Garmin Connect. Please let us know what you think! I am here to answer all your questions. @tapio - the GPS button has a long tap menu --> Turn on/ Turn off. Good enough? I only discovered this feature myself while writing this post. Useful for me too. No, ona ta mapa je i s panelem skoro 2x vyšší než širší, takže já to jak omezení nevidím. Určitě si to někdo přál, a hodně uživatelů je rádo, že tam panel je, protože mohou při plánování průběžně sledovat celkovou statistiku a náročnost trasy. Where are the options for GPS filtering? I was not quite sure if the GPS filtering were in "GPS and sensors" before. I thought it was in the hidden "expert menu". Maybe it now replaces the previous filtering setting in GPS and sensors > Altitude Manager > Altitude Filter? I think the GPS position filtering has been moved from ( by default hidden ) expert menu in LocusMap Beta to GPS and sensors menu. The altitude filtering in the GPS and Sensors/altitude manager has its own independent filter. I've made a little Land Rover Defender, top view. Navigation from both internal and user profiles is fully functional again. Good job. when you log something offline there is a checkbox called "Nur Log-Datum" ("Only Log Date" I guess in englisch) underneath the editable log date and log time. When this checkbox is checked only the log date with a constant log time is stored in the corresponding fieldnote. Unfortunately this checkbox is hidden by the keyboard so you can not see the current state of that checkbox immediately. Maybe you checked the checkbox by chance somewhere in the past. When unchecking it the actual time of the fieldnote should be stored again and you are able to log the founds in the correct order per day (earliest first, 07:00 am for example, latest last, 08:00 pm for example). geocaching.com does not store the time of a found anyway so you have to be sure, you log the founds per day in the right order, to get a correct log-id at geocaching.com representing the correct found order of that day.